Thanks for getting in touch! You can contact us anytime and we’ll get back to you quickly. Let us take care of your insurance needs by scheduling an appointment today! "I never thought I would be able to find such an amazing insurance that would cover my auto even in Mexico." "I like how easy and convenient it is to enroll on their website." 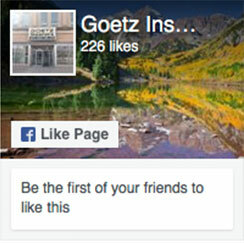 "One of the many reasons I love Goetz Insurors is that they care about their people and their customers."